Twitter is a micro-blog that lets you make posts of up to 280 characters. It is the most efficient platform to engage your audience through conversations. As such, timeliness is especially crucial. Have an event coming up? Start an event hashtag, encourage your participants to tweet about the event real-time, and join the conversations. Remember to engage with relevant tweets by retweeting and commenting. Upload a profile and header photo (see image guidelines below). Add a profile description, and link your research/personal website (if you have one). Start following people. This also lets the other person know you exist. Your Twitter feed (which only you can see) will show the tweets, retweets and occasionally likes of the people you follow. Post tweets up to 280 characters long. Engage with (e.g. like, retweet, comment) other people’s tweets. A professional yet interesting personality is key on Twitter. Tweet/retweet often. Twitter is all about a constant flow of content. Utilize 1-3 hashtags per tweet. Hashtags are often integrated into a tweet (versus included at the end of a message). This will help users find your tweets. Tag users whenever possible. 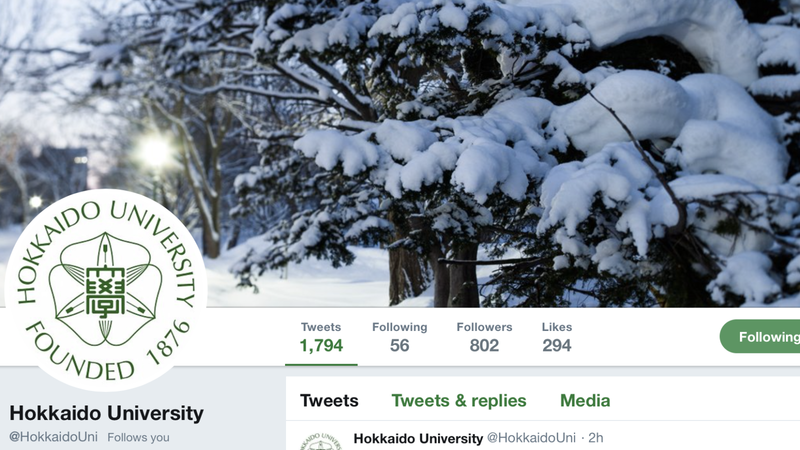 For example, adding @hokkaidouni will ensure we receive notification of the tweet. Be relatively casual on Twitter. Try to avoid using overly technical jargon. Turn on Twitter Analytics to see statistics related to who is viewing your tweets. This will let you cater your content accordingly. We do not recommend linking your Twitter to either Facebook or Instagram. Auto-shares to Twitter from Instagram may not show the picture unless you use third party software, and Facebook posts may appear as a link. You also run the risk of overrunning the word limit. Upload a square profile photo around 400px to avoid compression. Header is a 1500 x 500 rectangle. You can adjust the position of a photo if the dimensions are different. You may want to try to keep the images attached to your tweets at around a 2:1 ratio to avoid accidentally making the size of your post too long.